Not just an replacement, but an improvement! These notes are not intended for end-users. Please have your amplifier manufacturer read this, in case of a spark problem. A cold tube does not comply to the data sheet. For instance, the initial filament current for a cold tube is up to 8x higher than normal. A rectifier tube should not be used as "slow start" element for the whole amplifier. Power Supply chokes may saturate at power on, and stop being a choke for that moment. Power supply capacitors that are empty, will cause absurd surge current at power on, if there is no control mechanism. Power supply capacitors are at or above the rectifier tube maximum. Power Transformer Raa resistance forgotten to adjust for the rectifier tube chosen. Values are random, and can be too low. People switch off and on the amplifier, not knowing how long to wait in between. Coupling capacitors are empty at power on, and during charge cause positive Control Grid Voltage on the grid of the next tube. Meaning this tube pulls highest possible current it can do. With DC coupled amplifiers, the bias of the output tubes depends on how (fast or slow...) the DC coupled drives stage becomes stabile. For 10 seconds, output tube bias may become 8x higher. When you use one or more "maximum" specifications of a tube data sheet., make sure you do not exceed this at switch on. These, any many other factors may cause surprises. Doing these things right, separates the good designs from the less good ones. And nooooo ..... please we don not want to hear about it a circuit with a plain error in it, used for 35 years by a company without any problem. What is wrong to do, is wrong to do. Even when it seems to work. A white spark can occur within every large size tube with Barium oxide coated filaments. (Barium oxide means the tube lights up red-orange. (For a tube like 845, that lights up yellow-white, this does not apply). The spark is caused by the Anode current for a very short moment being above the maximum allowed value. This value is specified in the data sheet under MAXIMUM CURRENT. Probably you have a large surge current somewhere, causing the effect. This is particularly a big problem when the tube is not fully warmed up yet, and you FORCE the maximum Anode current, or even above. In this case the rectifier cathode surface is not emitting electrons evenly distributed. So the maximum current density on some specific spots is exceeded in that case. These spots get too hot locally, and some part of the surface can chip off. The dust particles get hit by the electrons, and get charged. Then, they become subject to the high electric field inside, and hit the cathode everywhere. The result is an avalanche, tube current becomes suddenly very high, and the particles light up brightly. What you observe is a flash like short circuit. Rectifiers recover from this, as well as later technology EML tubes. Tubes like KT88 do not recover, and the grid is damaged. In case the maximum current is exceeded, some tubes will produce a spark, others will not. It must be clearly said, this is no requirement for a tube to respond silently to such an abuse. The requirements are rather with the amplifier design. Just respect the tube data sheet to begin with, and understand that maximum conditions are not possible for a tube that is barely warm. The worst is when the rectifier is used to limit the in rush current for the whole amplifier, whereas this effect is based on the rectifier tube to be in the warm up phase. When you see this is linked to only one tube of a pair, it only means one of the two responds to the abuse with a spark. Yet, both tubes are abused, and if you cure the abuse situation, the spark will be gone. With any electronic device that gets hot, such as power resistors, large transistors and also electron tubes, the MAXIMUM values are fatal limits, and when exceeded a defect will occur sooner or later. If no effect seems to occur right now when you try it, you may likely get the defect later. So using a power device at it's maximum values is something that needs very wise consideration, and most of all: measurements. Just "see if it works" is no good way, and it proves not much. Apart from this, it is highly recommended to do a worst case test, with all possible tolerances at it's maximum, like maximum mains voltage, and maximum ambient temperature at the same time, use maximum output signal, and connect somewhat lower impedance speakers. THEN test if your tubes operate SAFELY below maximum limits. Here is an experiment which will demonstrate the problem. Take a old rectifier tube, that is basically good, and you can do some bad experiments on it. First, you force 100% of maximum current through it, by simply load it hard enough. Provided the tube is still capable of this. Now, reduce the heater voltage slowly, until the Anode current begins to reduce. When you see this, you increase the load, or the Anode voltage, so the Anode current will stay at maximum by the data sheet. Now, reduce the heater voltage further, and again you force the Anode current to stay at 100%. Of course you will reach a point where the poor tube will give up on this. Very likely though, BEFORE you will reach that point, the rectifier will flash. It short circuits as a result of this, and discharges the capacitors with a spark noise and a flash. This is the effect, and now you have seen it. Interesting, the tube is likely to survive this. Just a small chip of emissive coating is blasted away, and the tube can do without it. If you repeat it over and over, the tube gets bad. What happens if you exceed the maximum Anode current of an electron tube? Power tubes like the Emission Labs ®tubes, have always strong overcapacity of the emission. So you may not see immediate loss of emission when you make a short mistake. They recover from most errors when still new, and when the error did not result in excessive heating of the Anodes longer than a few minutes. The current density of the cathode coating is physically build by many small "current islands" which grow together, and build an electrons emitting surface. In the above experiment, by underheating the filament, we made the islands smaller size. So there is no more nice emitting surface, but many emitting "points". Even at normal operation, the Anode current it's not evenly divided over the surface. When the maximum current density is exceeded, it can happen that material from the cathode is chipped off, at exactly these places (islands) where you have the highest emission. This island is now "dead" and a very small white dust particle chips off. Read in the next lines, what will happen to the chipped off material. The electric field inside the Anodes is as large as 1500 Volt per centimeter. Because of this high field gradient, and the electron flow too, any piece that gets chipped off, will be electrically charged, and move around. When it floats in vacuum, the Anode current flows through it, which current is actually very high during that moment. The energy this chip gets exposed to is very high. The chip is high resistance, but the voltage is high also, and within extremely short time, the chip gets heated up. This makes it evaporate, and the result is a conductive, ionizing effect. You can call it a conductive cloud. This give a light effect. The spark has a negative dynamic resistance, meaning it it's "ohm" resistance gets lower, when the current gets higher. So this gives an avalanche effect, drawing extreme peak current. This can force the Anode voltage down to 100 Volt, regardless at what voltage was. You can think of the tube acting like a 100 Volt Zener diode at that moment. This can easily blow the Anode voltage fuse, or the main fuse of the whole amplifier. This will give a very loud crack sound from the speakers. The tube will recover from it, since the vacuum is not damaged by this. The tube works normal again. Just locally, some chips are blasted off the cathode. Triodes: Positive Control Grid Voltage. Bad electronic circuit. See the checklist below. Diodes: Too low first capacitor, too fast rising Anode voltage at switch on. Bad electronic circuit. A white spark is NOT a bad tube issue, and it is NOT a short circuit of the tube. Vacuum can not short circuit. Question: Why does it mostly occur with a new tube, and not with old tubes? Answer: It is easier to exceed the maximum peak current when a tube is new, when it has highest emission reserve. So you may observe this with larger tubes, and with newer tubes. But it can happen to any tube, when the electronic circuit is not good. In that case it will particularly happen when they are a high emission kind of tube. In electronics this effect is called "trigger". What peak value do you measure for Anode current at switch-on or switch-off? DC-coupled circuits need to be measured very carefully for this, they can behave unexpectedly. The following are very useful items, which can SOLVE and PREVENT problems. You are a happy designer when you already tested your tube amplifier for all of this, but perhaps one of this points may be helpful to you still. Who knows! What can you do if an amplifier tube is sparking? Disconnect the coupling capacitor to the end tubes. If the spark is gone now, you have at least localized one design error. A standby circuit sometimes solves the problem, but... when made wrong can also be the cause of unexpected, hard to understand problems. Don't even think of using a standby circuit, when you have no good way to measure surge currents that may result from it. You try to do something good, but may be doing something very bad to the tubes. Overdriving DHT power triodes is definitely not allowed. Will the amplifier allow for excessive overdrive with the volume at maximum? If yes, this is an elementary design mistake, and you need to correct this. Overdrive must occur in the driver stages first. So the end tube is not in an overdrive condition yet, while the driver stage starts to clip or distort. This allows the user to reach the overdrive level, and effectively not overdrive the end tube. Reduce the grid-to-ground resistor to the data sheet value. 2 Mega Ohm is fine for miniature tubes, but not a good value for a 300B tube. A low enough grid-to-ground resistor will protect against the coupling capacitor surge current. At switch on, the voltage across the coupling capacitor is zero, and then this large capacitor gets charged within a fraction of second. Charging a capacitor will make a DC current flow through the grid-to-ground resistor. When this resistor is too high value, POSITIVE Control Grid Voltage results from it. The tube will now try to produce the absolute maximum Anode current it can do, and at high enough Anode voltage that will (of course) give a spark in the tube. The better quality the tube is, and the newer it is, the higher the chances on a spark. This is why we specify limits to the grid-to-ground resistor. What counts is the R x C product, so also read the next paragraph. Change the coupling capacitor to the smallest value you need for good frequency response. Oversized coupling capacitors are the number one problem makers for DIY, but also professionals make this mistake often. It can damage DHT tubes. Calculate the correct value, and verify it by a measurement. The coupling capacitor to the end tube is where you need to limit the low frequency response of the amplifier. Do not oversize this capacitor, and leave it up to the transformer in a natural way to limit the low frequency response. Whatever you do, always measure the peak-current in the end tube at switch on. Perhaps you will be surprised how large it is. (And again. we have the maximum value for that in the data sheet). A grid series resistor can partially help to reduce the Anode peak current at switch on. This resistor will give an RF frequency roll off, which is why designers put it in. It prevents ringing, and also it reduces interference from radio stations. This is why you see this resistor in professional designs. What you can do for HiFi is choose the resistor low enough to get a frequency roll off outside the audio range, but choose it high enough to limit the grid surge current (into the grid, via the coupling capacitor). The R x C product here is coming from: Series resistor value, and tube grid capacity multiplied by tube open loop gain. (For Miller effect). So the value must be chosen with brains. Not just take "some" value that you see in other circuits. Often these people just copied it also from another design, and so on. Measure what the resistor does. Where does it make the roll of start? When at 10Mhz, it's useless and wrong chosen. When at 30kHz/ 3dB, it's too close to the audio range of course. Please Calculate your designs, and verify it by measurements, and measure the switch-on surge current, and also the switch-off surge current. Measure systematically everything. Trial-and-error designs are one thing, but if you don't at least measure the results of what you produced, you don't know what the circuits really does! You may be heading for defective tubes without knowing it, and when it does happen, not realize where it comes from. What peak value do you measure for the grid-to-filament voltage at switch-on or switch-off ? What peak value do you measure for Anode current at switch-on or switch-off ? Since you must count with people overdriving your amplifier even if you warn for it. Make sure the overdriving and limiting takes place in the driver tube, and not in the end tube. This gives good protection to the end tube. What can you do if a rectifier tube is sparking? Measure the peak current, and verify it against the data sheet. Remember the derating curves have to be used. If not, the tube may develop a problem later. Check if the HV windings of the transformer do not have too low DC resistance. 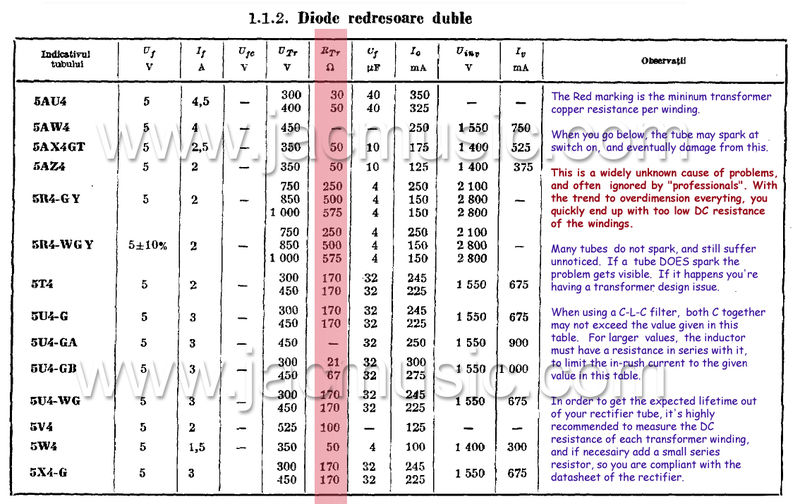 This is a widely unknown specification, but it exist for ALL rectifiers! If the resistance is too low, add a series resistor. Do not blindly trust transformers made by "manufacturers". We have seen so many errors with this already. In many amplifiers you can measure this directly from the tube socket when you take out the rectifier, as the AC windings are normally directly connected to the tube socket. Check the schematic first. Please read this - And this also . Make sure the Anode current is NOT higher than normal during the start-up moment of the tube, specially not at a moment where the filament voltage is lower than normal. Please measure this, instead of guessing it. For the peak current during start up, be aware that with a C-L-C filter, capacitors C1 and C2 are in parallel, because the choke is often working at the start up moment. The choke is often saturated during that short moment, and the very moment it does, it becomes a copper wire only. Add a series resistor in the choke circuit, to prevent problems like this. Measure it, with a scope is the only good way, and you may be surprised of what you see. Most specially here, we say: Measure it. Do not try to replace a measurement by verbal logic. Whatever you do, make sure the capacitors of the power supply are empty when you switch on the amplifier. Good practice design rules say, capacitors should be below 40 Volts, 20 Seconds after the amplifier is switched off. Checking this is a very wise idea. If your are above 40Volts, your amplifier is not build by good safety standards. So you need to add a bleeder resistor. Then, after switching off the amplifier, wait 1 Minute before switching on, and most likely your "spark problem" is cured, indicating as always, this is an amplifier problem and not a tube problem. © Emission Labs ®. All Rights Reserved.